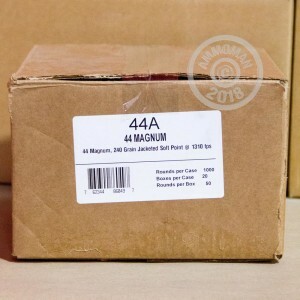 This .44 Magnum soft point ammunition is an excellent hunting round and can also serve in a self-defense role if hollow points are not an option. 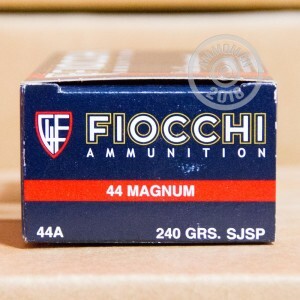 Loaded by Fiocchi of America in Ozark, Missouri, these cartridges fire a 240 grain projectile and deliver excellent terminal performance against game. 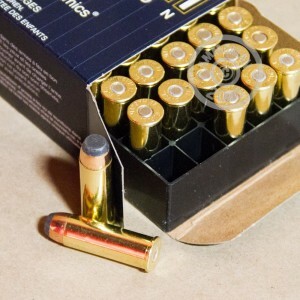 The .44 Magnum is a powerful handgun and rifle cartridge suited to killing deer and hogs at short to medium range. It was introduced in 1955 and derived from the .44 Special, which has a shorter case and a lower pressure powder charge. Buy a few of these 50 round boxes or pick up any other items priced $99 or more to qualify for FREE shipping from AmmoMan.com! I used this ammunition to practice at the range, and it was a milder load than American Eagle and a pleasant paper punching round. I was hitting the bullseye at 20 yards with my Ruger Super Blackhawk without any issues and the round offered very consistent performance. I intend to buy more of these fine rounds.